This kit features a 255 L/PH external inline fuel pump capable of handling up to 600 HP Select this option for your fuel delivery system and you will have a 255 L/PH inline high pressure, high volume EFI pump that will provide enough fuel delivery for up to 600 HP. Kit also includes fuel lines, fittings and two billet fuel filters and enough premium quality hose for an inlet and return line. The filters include a 100 micron pre-filter and a 30 micron post filter. Note that when using this pump a return line to the fuel tank is required. 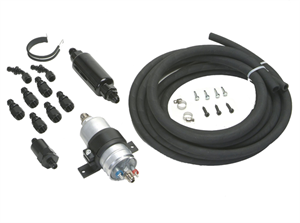 This Fuel Delivery Kit includes an EFI grade 255 L/PH inline external fuel pump that is suitable for engines making up to 600 HP. (Note that some of our EFI kits are limited to less than 750 HP due to maximum usable injector sizes.) This kit also includes 20-feet of EFI grade fuel hose suitable for both the inlet and return lines between the fuel tank and the engine. The kit includes two billet fuel filters. The filters include a 100us pre-filter and a 30us post filter. The hose and hose ends are push lock style for easy assembly. The hose is high pressure EFI grade.